Mathew: You know how some people are really pretty, but not very smart? Helm: Yes. And some people are neither pretty nor smart. I will not mention a name. Mathew: Don't distract me from my review. Well, this movie is pretty, but it's not very smart. Although, it puts on glasses. Mathew: Like in a lot of Hollywood movies, when they want to convince you that a pretty girl is actually smart, they have her wear glasses. It doesn't make her any smarter, but it makes her look smarter, and that's all they really want. This was a pretty movie with glasses on. Mathew: Which is kind of how I felt about this whole movie. Like with the opening sequence...I think I understand, but then I kinda wonder if I don't. And then I think I probably do, but I get suspicious that there isn't a whole lot to really understand. It kind of reminds me of the TV show Lost. Helm: Not surprising. This film was re-written by one of the key writers of the show Lost, Damon Lindelof. Mathew: I could kick that guy. Helm: Yes. I think that would be appropriate. Mathew: I kinda wish I could see the movie that Jon Spaihts wrote--you know, the movie that was supposed to be the prequel to Alien. That's what I paid money to see. I mean, I didn't hate this movie, but I was sad about what it wasn't. Mathew: So, I guess we better do the actual review part. This movie was acceptable within the cannon of Alien movies. It wasn't as good as Alien, which ruled but is kinda slow in places, it was nowhere near as good as Aliens, which is like the lord God of Alien movies, it ruled over Alien3, which is one of the dictionary definitions of the word "ill-conceived", and it was marginally better than Alien Ressurection, which was directed by a French guy, had Winona Ryder in it and also featured that Baby-Huey Alien. Helm: Blech. The Baby-Huey Alien. If I could shudder, I would. Mathew: Yes. Anyway. 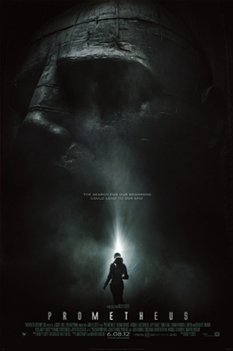 So, on the pro side, Prometheus has got these really great images in it, there's some great action, a few good scares, some pretty good performances and there are some ideas that are really cool. And it's an Alien movie. I think there's supposed to be at least one of those every decade. Helm: But on the con side, it features many glaring instances of stupidity and poor research, a number of clumsy or poorly directed performances, a fundamental lack of understanding of scientific thinking (as well as science in general) and a cast of pointlessly irrational and idiotic characters who do dumb things. Mathew: The geologist? With the worm thing? Helm: The geologist, the archeologist, the commander (or whatever she is), the biologist... the list goes on. Mathew: And what was up with that whole thing with the other thing? Helm: The thing with the drop of goo thing? Mathew: No. That was kind of inexplicable in terms of what the motivation was, but I meant the other thing with the other thing. Helm: The thing with the airlock thing... with the guy with all the fighting? Mathew: No. That was puzzling too, but I meant the other other thing with the other thing. Helm: The thing with the whole plan from 2000 years ago thing? Mathew: No. Jeeze! The thing with the "Let's see if we can trick it into thinking it's alive" thing. Helm: Oh. That thing with the other thing. No idea. Why would anyone do that? Especially any kind of scientist? That was not just inexplicable, that was un-explicable. Mathew: Un-explicable. That's actually a great description of Prometheus.